Decent Southern Smokehouse food in a sports bar atmosphere--that's how I'd sum up my visit with a friend to Daisy Duke's recently. We arrived on a pleasant Friday evening and were promptly greeted and seated by one of several waitresses. All were dressed in "Daisy Dukes"--short-shorts. Makes sense, I guess. We ordered an onion ring appetizer. It arrived hot and crunchy. The onion rings were very good. The crunch was about the best ever that I've had for an onion ring and they arrived hot but not at all greasy. They were served with a delicious mesquite diping sauce which seemed to be ranch based--it was very tasty with just a hint of mesquite. Overall, I'd say the onion rings were excellent. My friend ordered a cheesesteak sandwich: the Works Philly sandwich--stuffed with tender chicken, mozzarella cheese, green peppers, onions, and mushrooms. It was delicious if a bit messy to eat--but then again, what Philly cheesesteak isn't messy? I think this would be a great lunch item. Note to self: "go there for lunch some day." I ordered a side salad to begin with, and a "Hog Platter" for my entree: the Hog Ribs Platter with sides of coleslaw and BBQ beans. Yumm. The side salad was good and an ample portion--nice fresh romaine with all the accompaniments. It was a good side salad and hit the spot. My food arrive hot and flavorful. The ribs appeared to be a St. Louis cut but not style as they did have some sauce on them. Still, they were wonderful, tender, and juicy--very good ribs, no doubt. The pulled pork was also very good, but typical of pulled pork in many a restaurant when it's done well. I added some of the house BBQ sauce which seemed to be a "one fits all" concotion--fairly sweet, just a touch of heat, just a touch of smoke. It was good, but not great. The beans were, unfortunately, just ordinary. Nothing really popped. Now they were certainly steps above the stuff you get out of a can, but they could have benefitted from some slow cooking with a bit of the pork bark. They were good, just not great. The coleslaw was as good as most coleslaw is. Nothing to write home about, but i did finish it all and it was tasty. Overall, we had a good meal. The atmosphere is definitely a sports bar. It was not very crowded for a Friday night. Then again, maybe the colleges were beginning a Thanksgiving break. Daisy Duke's is located right by the International Speedway too, so I imagine they do a good business during race weeks. Would I eat here again? Yes, definitely. The food was good if somewhat predictable. It would be a fun place to have a few drinks with friends, too. I'll recommend Daisy Dukes, give it a try! I've eaten at First Watch a number of times, and it's always good--and always busy. I guess the fact that it's busy is a fitting testament to the good food there. I'd eaten at the Longwood location previously and always had a good experience. But this weekend my friend and I decided late on Monday morning to head off and get something to eat. So we headed to the Altamonte Springs First Watch, anxious to see if it was as good as the other location. We were not disappointed. We were greeted promptly and saw a bit of a crowd waiting, but were told it would be a 10-15 minute wait. True to their word, it was not that long. Our server was friendly, competent, and reliable. We'd perused the menu while waiting and so ordered promptly. Equally promptly, the food came out! My friend had a "normal" breakfast--eggs over easy (perfectly cooked), potatoes, sausage links, and an English Muffin. He topped that off with a pancake. All the food was good. I had the Killer Cajun omelette--an omelette stuffed with tender pieces of spicy cajun chicken breast, mushrooms, onions, and monterey jack cheese. It was served with a side of Santa Fe Dressing--and had a nice kick to it, too. The omelette was very, very good, the dressing a nice compliment to it. If I had any complaint, I'd say the breakfast potatoes were a bit dry, they could have used a bit of moisture or maybe some bacon or something to liven them up. They were not bad, but just OK. Likewise the English Muffin--though good enough, it was more rubbery than crispy, probably having been held for longer than it should have, or made ahead. Nonetheless, we had a very good breakfast here and would certainly go back. The have a very nice an innovative menu with interesting combinations of flavors. I've never had a bad meal here. The streak continues! Total bill which included a coffee and iced tea was about $22, not bad. Great Czech and European food has come to Longwood! 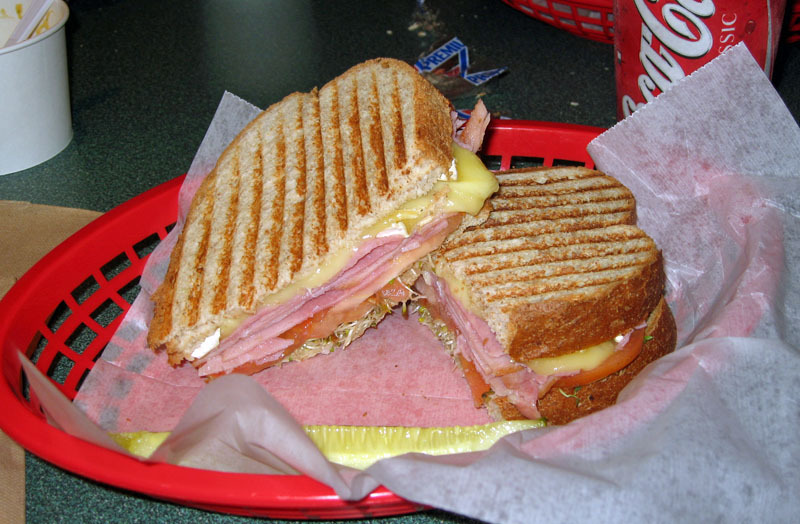 Several years ago, the owners of the original Chef Henry's Cafe on Howell Branch Road sold their restaurant to Chef Hans who kept the same good food but changed the name to Chef Hans Cafe. Well, Chef Henry came back to town and is now open in Longwood, on 434 just east of I-4. I'm glad they did! Chef Henry's is a quaint restaurant occupying the space formerly occupied by Journey's. It's not huge, but is quaintly decorated and has a fair amount of outside seating. There was another table of 8 or so, and a table of maybe 2-4 other people. It was not crowded, though we were told that they do a very good lunch business. And they have only been open three weeks. I'm sure as word spreads, they'll get busier, based on the great food we had there. Chef Henry's is definitely a family run business. We were promptly greeted by Evelina, a daughter of Henry and Estera, the owners. She provided excellent service during our whole meal and was very forthcoming with details about the restaurant, their food, and their business. It was a very pleasant experience, indeed. Our dinners were preceded by a salad and a basket of bread. The bread had to be home made. It was excellent. Very artisanal-like with a nice bready taste and a crispy, chewy crust. It was served with a "dressing" of cream cheese and hungarian paprika. Delicious. The salad consisted of a single leaf of Romaine topped with some diced tomatoes and cucumbers and some sliced potatoes, and dressed with a sweet-ish dressing. It was delicious. I am not a big cucumber fan at all, but this was good and I loved it. My only complaint was that I wished there had been more of it. Yumm. We started with an appetizer of Halušky--basically spaetzel with goat cheese and a few other secret ingredients that gave it a slightly acidic but creamy and savory flavor, topped with just a bit of bacon bits and scallions. It was absolutely delicious, and quite filling. We were smart and did not finish it off, saving room for the main course. For the main course my friend had Creamy Champignon--two huge veal cutlets pounded thin, breaded, fried nice and crisp, sittin on a bed of red cabbage and topped with a creamy mushroom sauce. It was excellent. 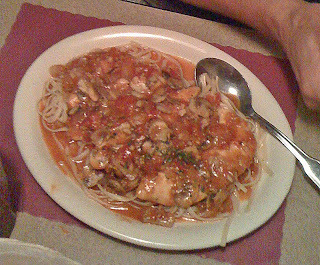 The veal was tender, the breading crispy, and the sauce creamy and with a great flavor--the woodsiness of the mushrooms. Excellent flavors! For my main course I had the Chicken Rouladen. This was a cutlet of skin-on chicken that was flattened and pounded somewhat thin, then layered with a spinach and gouda cheese mixture, and wrapped around some stuffing. It was expertly cooked and presented! The skin on the chickin was crisply, there was just a hint of the advertised apricot compote on it, and the flavors were spot-on. The chicken itself was very tender, the dressing with a hint of sage but not overpowering, and the Spinach/gouda mixture expertly complimenting the other flavors. This was truly a great dish. I have only one very minor complaint. The red cabbage was excellent. But some of the juice from the cabbage met the chicken and should not have. The cabbage is great but a strong flavor and best eaten separate from the Chicken, so it would have been better to somehow separate the two. This was a great dining experience, but we weren't done yet. After we'd gotten the check and were about to leave with our ample portions of leftovers, we decided to have a cup of coffee outside on the patio. It was a perfect night for it. Evelina took great care of us again. While we were enjoying the night air, Chef Henry himself came out to have his evening meal. He was very friendly and said hi, and also enjoyed our compliments, I'm sure. It was a great evening and we had a great time. I'm sure I'll return to Chef Henry's. Knowing that they do a good lunch business and are so close to my employer (about 5 miles away), I know I can drag some coworkers down here. I know they'll be impressed. Our total bill which included two Czech beers, an iced tea, appetizer and two entrees came to about $58. Not exactly cheap, but we have three more meals between the two of us that we took home and a great dining experience. I recommend this place, most definitely. If the "old" Chef Henry's Cafe can provide any lesson, once this place gets going, you'll definitely need reservations! Great Mexican food can be found in Orlando, and Paxia provides it! It was several months ago that I first heard about Paxia Alta Cocina Mexicana and put them on my wish list, but only last night that I finally went there. I'm glad I did! First, the bad: their web site basically says "coming soon" but they've been open nearly a year. I think it's time they got with the program and got a web site up and running, complete with menus. But, that's it for the bad! All else was good. We were promptly greeted and led to our seats. It was not busy at all, but was early on a Sunday evening. Still, our waitress was attentive and we did not lack for anything. Our drink orders (Iced tea and Dos Equis) were promptly taken and we were served with some delicious chips and salsa--the salsa was not the wimpy stuff you get at most so-called "tex-mex" restaurants--this salsa had a bit of heat. Not too hot, but enough to let you know it was there. It was very, very good! We started with two appetizers. The first was Emanadas De Res--Two corn emanadas filled with sirloin and potato. It was served with what was billed as a jalapeno-infused dipping sauce. The sauce was very hot. It seemed much hotter than the heat of jalapenos. I was thinking "scotch bonnet" but whatever, it was good, but only in small portions. My friend stayed away from it--too hot for him! The other appetizer was the Napolitos--a mixture of prickly pear cactus, tomatoes, onions, and queso blanco with some cilantro and extra virgin olive oil. I'd never had cactus before. It was very good. It had an interesting flavor, very savory. I'm not sure how to describe it, but it was good both with chips and just alone, one forkfull at a time. Yumm! 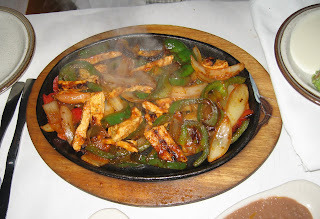 For dinner my friend ordered the Fajitas De Pollo. Wow, were they good. Tender grilled chicken with peppers and onions, they were cooked and seasoned very well. They were accompanied by an excellent guacamole and sour cream. Yellow rice and refried beans were served as go-withs. All were very good. 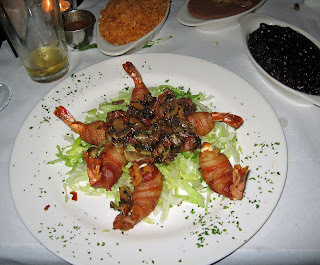 For my dinner, I had the Camarones a la Tequila--six large tiger shrimp wrapped in bacon, stuffed with queso blanco and sauteed with tequila marinated mushrooms with a touch of pico de gallo and on a bed of shredded lettuce. They were excellent. The shrimp were well cooked without being overdone--that takes skill and I was impressed. The mushrooms/pico added a very nice depth of flavor that was complemented by the crispy bed of lettuce. Truly, each bite was an exquisite experience. For go-withs I had yellow rice and black beans. Teh black beans were just a tad bland, but when I added just a touch of the empanadas' jalapeno-infused sauce, they came alive! It was all very good. We had an excellent meal here. I am no Mexican food expert, but it seemed authentic and was very, very, good. I would eat here again and would recommend it. With tax but without tip, and including two draft beers, our total was about $50. Not cheap, but certainly worth it. A gem of a place in College Park. I hope they do well. Eclectic Place. Good Food. On Beach Street in "downtown" Daytona Beach. We were attending the Halifax Arts Festival last Sunday and getting a bit peckish. We'd wanted to eat at Dancing Avocado Grill as heard it was good, but they are mostly open daytimes, never at night. So we took the opportunity to have lunch there. They do serve breakfast, but only until 11. We were too late for that. And normally they are closed on Sundays. They were open this day due to the Halifax Arts Festival. Good move! They were doing a fair business by the time we left at noon. Good for them! My friend ordered the Chicken Quesadilla. It was delicious. It had large pieces of tender and savory chicken with the requisite cheese between two crisp tortillas. Definitely a good meal and filling. He also had the lemonade. 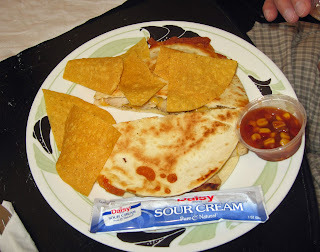 The quesadillas were served with some packaged sour cream and a few chips with a bit of a sweet salsa. The highlight was the quesadilla with the perfectly cooked chicken, though. I had the Pulled Pork Sandwich with Herbal Raspberry Iced Tea. Both were good. The pulled pork, though it did not look very special, had a nice flavor--well cooked and served with some diced onions mixed in that gave it a nice crunch. 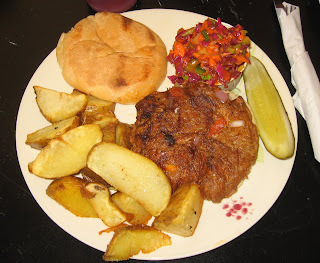 It was tender and flavorful and served on a delicious Kaiser type roll. It was served with "fries" that were actually wedges of potatoes. They were delicious well seasoned, and fried just right. Accompanying this was a small dish of tri-color coleslaw. Though on the sweet side, it was delicious--red cabbage, carrots and celery were the main ingredients. But it sure was delicious. Would I eat here again? Definitely. The prices are low and the food is good. We sat outside but did get a glimpse of the eclectic indoor decor. It's very hippie-like is the best way to describe it. It's an experience, and one I recommend. 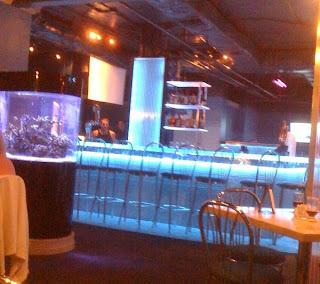 Good food in a chic atmosphere, that's what I'll think of when I remember Aquarium. And I'm sure I'll be back! I was browsing Daytona seafood restaurants on urbanspoon.com when I mentioned Aquarium. My friend had been there and said a quick "yes!" So off we went. The first thing I noticed was the atmosphere, and this is what made a good dining experience a lot better. The place looks like an aquarium. 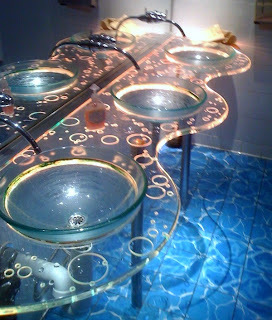 Glad and bar tops and even bathroom sinks and floor are aquamarine-lit lucite. There are several large aquariums, also lit. There's even a "bubble-wall," a tower of bubbling water or whatever that's lit with aquamarine lights. Very cool. We chose to eat indoors, though they have a huge patio area right on the Halifax River (Intracoastal Waterway) right by a marina (they even had live music out there and a scattering of people). Since it was dark out, we could not see much but this would be a nice setting in the daylight, right on the river. Our host quickly seated us and took drink orders. We opened the curiously thick and heavy menus only to find that they were backlit with the same aquamarine light--a very nice touch. And very cool. We started off with the Shrimp Pizza, shrimp, tomatoes, mozzarella, and basil on a type of bread. It was pretty good. Not great, but good. The flavors were good though I'd have liked to have seen a bit more bubbling and browning of the cheese. Still, it was tasty and we cleaned it up. For the main course my friend had the Extra Large Fried Fish Sandwich. It was indeed extra large: the bun was laid open and one large piece of lightly fried fish covered both part of the bun--and them some. The fish was cooked well and it was served with a tasty tartar sauce. There was perhaps more bun than was needed, but it was still a tasty sandwich. The fries that accompanied it were a bit of a disappointment. They were large crinkle-cut fries, but tasted more like they were out of a bag from the supermarket frozen foods section, and then had been allowed to sit just a bit too long. They weren't terrible, the just weren't great fries. I ordered a side salad and the Shrimp Dinner. The side salad was good, a typical side salad. Fresh and tasty, it hit the spot. But the real hit of the meal for me was the twelve good-size, butterflied, breaded and fried shrimp. They were excellent. Lightly fried, and not overcooked, the breading was crisp and crunchy but did not take away from the flavor and texture of the shrimp. To be blunt, they were cooked perfectly. So often I find overcooked shrimp--these were just right! Of course, with shrimp cooked perfectly, you have to eat them quickly before they overcook just from standing. That was not a problem. And, they did not need nor deserve any cocktail sauce. I did try the cocktail sauce and found it too sweet and with not enough horseradish for my taste. I did ask for and receive some extra horseradish sauce, but it could not overcome the over-sweetness of the cocktail sauce. Still, it was a minor point--the shrimp were that great all alone. There were some mixed veggies to go-with--squash, zucchini, and onions, that were also delicious. This was truly a very good meal in a very nice atmosphere. I see another review on urbanspoon.com that complains about the nightclub-like atmosphere, but I loved this place. Yes, it has several bars. Yes it has that nightclub feel. But that's because they also are a late-night hangout, I'm told. It would be a fun place to meet up with friends for a late night drink, definitely. Our total bill which included one appetizer, an iced tea, two glasses of beer, the two entrees with the added side salad, was $48. It seemed a fair price for the very good food and great atmosphere. Our server was attentive for the most part (forgot the iced tea refill once) and pleasant and competent, as were the other staff. It's a very cool place and I recommend it. I know I'll be back. I'd love to try it for lunch, to sit outside on the river on a pleasant day. I know I'll be back, assuredly! I've enjoyed eating in "downtown" Sanford a lot and decided to try nearby Limoncello's Waterfront Restaurante. I was disappointed and can not recommend it. 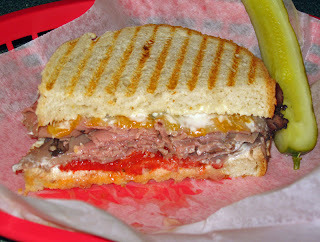 It was just OK, and certainly there is much better food on nearby First Street in Downtown Sanford--stick with that. It was Friday evening, about 8 PM, and my friend and I were hungry. I wanted pizza and, though I'd peeked in the door at Limoncello before, I'd never eaten there. Even though the urbanspoon.com ratings were not that great, I decided to find out for myself, so we ventured in. Trust urbanspoon more next time! We entered a seeminly empty restaurant (8 PM on a Friday evening and empty??) but were promptly greeted by the host, a pleasant young man who offered us a choice of inside or outside seating. We chose inside, though it was plenty chilly inside and would have been the same outside--a pleasant evening in the upper 60s. I'm sure the view in daylight outside is very nice as the restaurant's patio/deck is right on Lake Monroe. Perhaps in the daytime it would be enjoyable (and maybe busier?). Anyway, we were seated in a booth by the window. For an appetizer we tried the Fried Gnocchi. Basically, gnocchi lightly breaded and fried, then covered with extra virgin olive oil, garlic, parmesan, and some parsley. The flavors were good. The richness of the olive oil was not overpowered by the mellow garlic and the hints of parmesan and parsley. However, though the flavors were good, the gnocchi themselves were a bit rubbery and pasty. I think they were undercooked, they could have been fried a bit more. Perhaps they were overworked, too, which made them pasty (too much gluten developed). So, good flavor, but texture/chewiness made them overall a bit disappointing. Nice concept and flavor, poor execution. 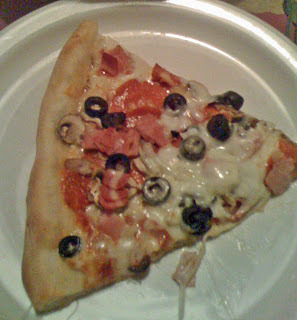 For dinner we ordered a large pizza with sausage, pepperoni, fresh mushrooms, and fresh tomatoes. Again, the flavors were very good. It was a good pizza, flavorwise. The toppings were each very good and plentiful. But the pizza itself was undercooked. The thin crust was doughy and the ingredients made it soggy, and the cheese not at all brown or bubbly. The center of a few pieces actually collapsed or seemed to disappear due to the lack of crust structure to support it. And for some reason in the center, there appeared to be two distinct layers of dough. I got the impression that the crust had torn and rather than remake it they just tried to patch it. It did not work. Even on the edges, the crust was only light brown and a bit undercooked. Maybe the cook was anxious for a cigarette break but it was (1) not left in the oven long enough and (2) not cooked in a hot enough oven. So, overall, the taste was good, but the preparation lacked and that made for a disappointing meal. During the time we were there, there was only one other occupied table outside somewhere, we did not see anyone else except the host and two waitstaff. I wonder how the place can survive with such light business on a Friday night. On the other hand, they do have a Saturday/Sunday buffet, and they are right on the waterfront by the Sanford marina. There is another choice of dining across the road, Wolfy's. Next time I'd pass Limoncello by and try Wolfy's. I don't think I'll be coming back here. Our total bill with and iced tea, two Corona's, a large four topping pizza, and the gnocchi appetizer was about $38. A bit steep for what we got. Live and learn. Trust the urbanspoon.com ratings more next time. I hope you'll trust my review and eat somewhere better--like First Street in Sanford, where you'll get much better food. Looking for quality dining at a fair price in historic downtown Sanford? Look no further! 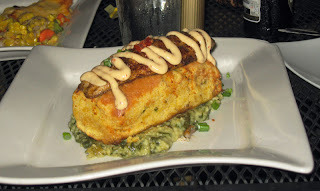 Two Blondes and a Shrimp is well worth your time and even worth a drive up if you live in Orlando--it's sooo good! Two of my friends, Tommy and Ronda, have recently opened an art gallery called Art Affair Gallery in historinc downtown Sanford. Consequently, I find myself spending more and more time in the area. Fortunately, there are some fantastic places to eat nearby. So last night after taking in the downtown Sanford Halloween "Trick or Treat" festivities (involving thousands of people and perhaps tons of candy), we decided to stay downtown to eat. We were not disappointed. I've been to Two Blondes and a Shrimp well over a half dozen time and have never been disappointed. Last night was no exception. Though downtown was very busy, it was past 8 PM and the earlier crowd at the restaurant was waning. We were seated promptly right by the street on the patio, a location we chose. There was a "one man band" with acuostic guitar playing some nice, easy-listening music, a nice touch. The evening was pleasant with a slight breeze, and it was nice to watch the comings and goings of the ghouls and goblins. But it's all about the food, isn't it? Our server was attentive and efficient, if not overly gregarious or outgoing. But we never lacked attention and got whatever we asked for promptly. Starting out with a Bass Ale and a Iced Tea, we took a few minutes to peruse the menu and then decided. I started with a side salad, a fresh salad of mixed greens with pineapple, craisins, red grapes, and a viniagrette. Very nice and very refreshing, all that a side salad should be. For the main course my friend had the Bourbon Pork--grilled pork tenderloin with a bourbon sauce (pictured left). It was wonderful. Grilled perfectly and tender and juicy, the gentle sauce complimenting the great flavor of the pork. And it was moist and juicy--they know how to cook a pork tenderloin. For sides he had a corn medley that contained "fresh off the cob" chunks of corn and a mix of a few other vegetables--it was both tasty and looked good. His other side was the famous so-called "macaroni and cheese." I say "so-called" because it's actually flat sheets of pasta with a cheesy sauce. The only complaint is that perhaps it's a bit two smooth, with an almost processed cheese or (heaven forbid!) Velveeta-like texture. Still, it was mighty tasty, very rich and creamy. I have since tried my variation or imitation of this dish, and very successfully, my friend said! For my main course I chose the Blackened Catfish Sandwich. Not really a sandwich, it's a large piece of banana chile cornbread served over a bed of creamed greens, and topped with a filet of cajun-fried catfish and a bit of a drizzle of a flavorful non-tartar sauce. It was wonderful. The bed of creamed greens was indeed creamy and cheesy, without a hint of bitter flavor that improperly cooked greens can give. It was very good. The banana chile corn bread was wonderful. The chile flavor was subdued and not overpowering--balanced by the sweetness of the banana; it was a very good cornbread. And the catfish? Well, it was divine. Properly fried and not overcooked, cajun-seasoned, it was very good. The dish was sauced with a nice tasting, hint-of-lemon creamy sauce, somewhat reminiscent of a tartar sauce, but without the chunkiness of that. It was very good and a nice compliment. Now for the other side. The portion of catfish was small and the portion of cornbread more than substantial. It make for a bit of unbalance. There was a lot of cornbread to eat for very little catfish. I think this dish would have benefited from a smaller portion of the cornbread (you can see how thick it is in the picture) and a more substantial piece of catfish. After all was said and done, I had more cornbread than i cared for and was wanting more of the catfish. After all, it's called a Blackened Catfish Sandwich not a catfish topped cornbread. The catfish should have been more of a star. Still, it was a very good meal, each indredient properly and wonderfully cooked, and each ingredient very good both by itself, and in combination with the others (if only the portions were a bit more balanced, that is). I've eaten here a number of times and will be back. 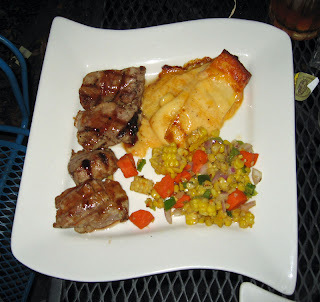 Along with their neighbor just around the corner, Stones Throw Bistro, there are two very fine restaurants in downtown Sanford--high quality food in a charming atmosphere and at a decent price for what you pay. Our total bill which was two entrees, a side salad, two beers and and Iced Tea was a reasonable $42 plus tip. Not bad, not bad at all. I recommend you try Two Blondes and a Shrimp and see if you agree with me!